After Jerrod Heard suffered a concussion against Texas Tech, Tyrone Swoopes (18) will guide the Texas offense in Saturday's season finale against Baylor. My brothers and sisters in burnt orange, we have come to the finale of the 2015 football season and the Texas Longhorns have an opportunity to cap it off as a spoiler. The No. 12 Baylor Bears (9-2) are playing for a berth in the Sugar Bowl. Nothing would taste sweeter for Texas fans than to knock off Baylor in Waco to end the season. How will they spring a Bear trap and finish the season with a smile? It's time to "Know Your Enemy." 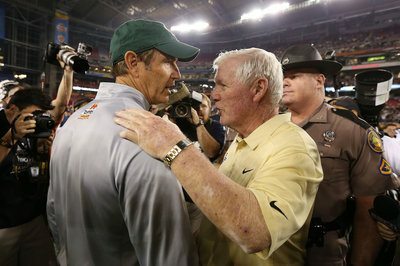 Baylor head coach Art Briles' offensive attack generates imagery of long bombs and a tricky pass-heavy strategy, but do not underestimate the Bears' running game. Baylor has the the nation's No. 4 rushing offense and ran for more than 287 yards per game in the last two weeks, which should give Texas fans pause. The Longhorns just allowed a 293-yard, five-touchdown day to Texas Tech, so it will be tough sledding to slow down Baylor. Stud Baylor running back Shock Linwood has fought through knee and ankle injuries, but the Bears, as they seem to do in all offensive positions, still have a number of other backs who can do damage. Chris Coleman has drawn comparisons to Golden Tate and was on his way to Heisman Trophy consideration when Baylor quarterback Seth Russell was downed for the year with a neck fracture. Coleman has put up insane numbers (1,364 receiving yards and an FBS-leading 20 touchdowns) and looks to get back on track after failing to find the end zone in the past three games. Texas will have to key a safety on virtually every play toward Coleman, which is going to offer a lot of opportunities for his fellow Baylor receivers. If Texas can keep Coleman from putting up numbers then we can say the defense did its job for the most part. Baylor has gained ground on Texas overall in the state recruiting battle and the teams will both be fighting to catch the eye of Brandon Jones, the top high school safety in the nation. 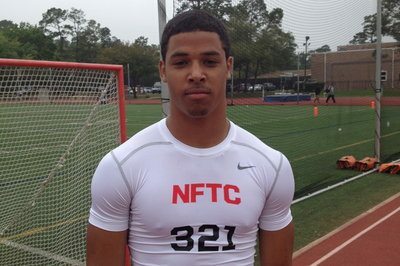 Jones has stated that he plans to be at the game and both the Longhorns and Bears are working hard to get the 5-11, 183-pound ballhawk. A Texas win would go a long way toward getting Jones to Austin. 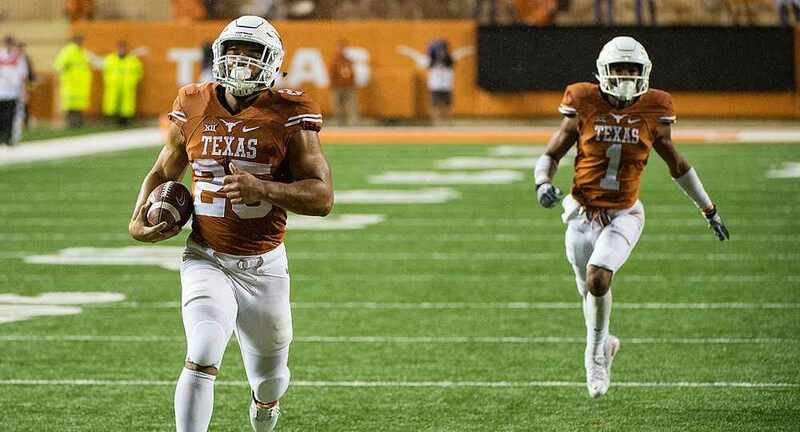 Running back D'Onta Foreman is a no-go Saturday and Johnathan Gray likely will be used in a limited capacity, which means it's time for Chris Warren (left), all day. Warren rumbled his way for 276 yards and four touchdowns against Texas Tech, establishing a new UT freshman single-game rushing record. Baylor's run defense is ranked 54th in the nation, and given that quarterback Tyrone Swoopes has struggled to generate any rhythm as a passer, there is no reason to look any other direction than Warren's. Expect Warren to get 20-plus carries like he did last week. The Longhorns are averaging fewer than 100 yards rushing per game on the road this season, and that is a statistic that has to change for Texas to stay in this game. Jerrod Heard will be sitting out this round versus the Bears, as the Longhorns want to make sure he doesn't suffer further head trauma (Heard suffered a concussion last week against Texas Tech). 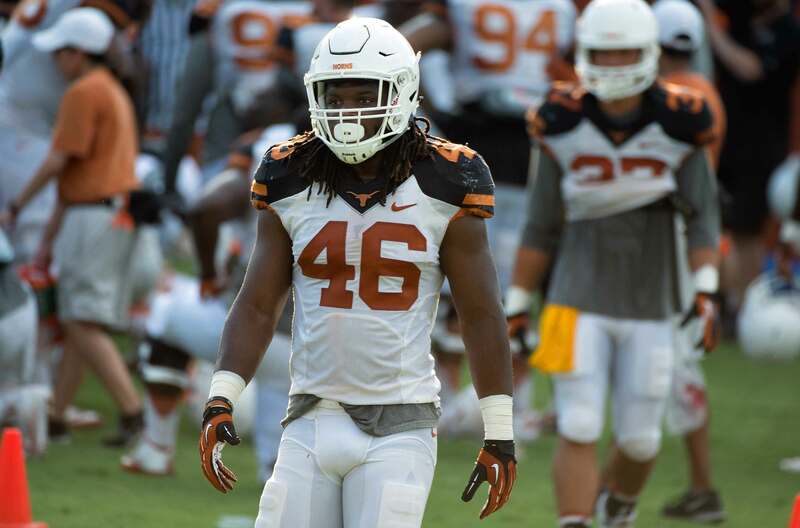 Nobody wants see David Ash 2.0, so it makes sense to start Swoopes. Here is where things get interesting. Offensive play caller Jay Norvell said this week that the team plans to play freshmen quarterbacks Kai Locksley and Matthew Merrick, both of whom are redshirting this season. This is stunning news, considering that Saturday's game is the last game of the season. 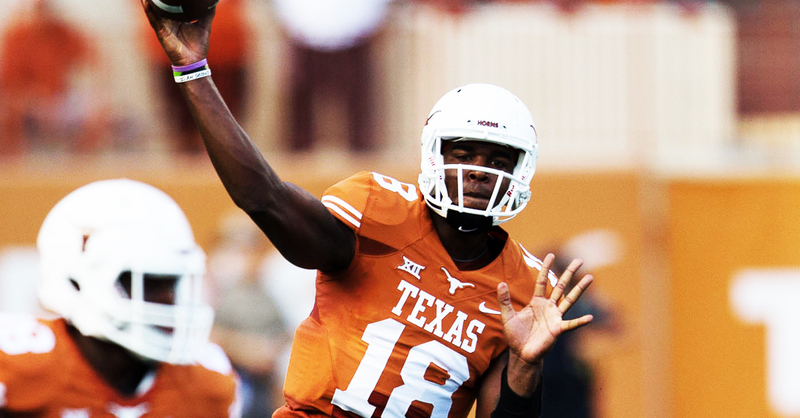 The Longhorns would be best served strictly playing Swoopes. He possesses experience and the best skill set to give the 'Horns a chance to beat Baylor and there is very little that can be learned from playing Locksley and Merrick in a single game. Anyone who requires proof of that just needs to remember when so many were convinced that Heard was the school's new franchise quarterback after he blew the doors off of California. Please, Charlie Strong. Do not burn the redshirts of two unknown players — not like this. Linebacker and all-around miracle worker Malik Jefferson, safety Dylan Haines and linebacker Peter Jinkens have all been ruled out for Saturday, which will put enormous pressure on what is left of the Texas defense. Texas is 0-4 in true road games this season, and has been destroyed in each loss to a tune of 18 or more points. Texas must keep third-string-turned-starting Baylor quarterback Chris Johnson out of sync, and that can only come from a solid pass rush. The question is, how do the Longhorns maintain discipline with respect to stopping the run and putting heat on a quarterback? Texas needs to figure that out quickly or the game could become a blowout quicker than Robert Griffin III can blow out a knee. Pray that Texas doesn't bite on play-action plays, because the end result would be Corey Coleman and friends going deep early and often.